In a terminal window, cd to where you'd like to install GAUSS (e.g., /home/user). Copy the downloaded installer file from where it was saved (usually /home/username/Downloads/GAUSS_19_Linux_64.tar.gz) to your current directory. A top level directory (gauss19) will automatically be created during the extraction process. Copy the downloaded installer file from where it was saved (usually /home/username/Downloads/GAUSS_16_Linux_amd_64.tar.gz) to your current folder. Enter a letter to choose an installation type. Note: If you choose to install GAUSS in a directory which does not have write permissions for normal user accounts such as /opt or /usr/local, then you must choose the Advanced Installation and Multi-User Installation options during installation. The Default option will install everything under the current directory. The Advanced installation allows you to choose a single-user or multi-user installation. If you choose a multi-user installation, the binaries and most of the rest of the installation will reside in the current directory. Each time a new user starts GAUSS on this machine, GAUSS will create a local working directory for that user under the user's home directory. The local working directory will contain the files and folders that which may be customized by the user. This allows the admin to install GAUSS in a location without universal write privileges. No files will be placed under the home directory of any user who does not start GAUSS. A copy of the license agreement for GAUSS will be displayed; press Enter to advance line by line, press the Space Bar to advance by page. When you are ready, enter "yes" to accept the license agreement and continue. Follow the instructions given by the installation script. Put the installation directory for GAUSS in the executable path and in the shared library search path. 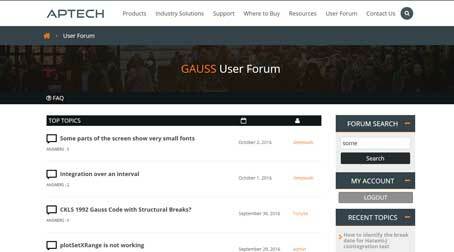 If you do not have a GAUSS License Activation Key, fill out this form. At the end of the installation process, a file named myhostid.txt will be created in the directory where you installed GAUSS. This file will contain the HostID number of your computer which you will need for your license request. Copy and paste the contents of the myhostid.txt file into your license request. You may also attach the file as well. To request your GAUSS license, fill out this form. If the HostID number is blank, click here. Start GAUSS and enter the applicable License Activation Key that you have been provided into the License Activation Window and follow the prompts. When you receive your GAUSS License File, simply place the File in the directory in which GAUSS is installed. Ensure that you retain the .lic file extension. The default location is: C:\gauss18 (or whatever version you are installing). Check to see that your License Type is NOT Demo.